People typically think about recycling as putting materials in their recycling bin—often, as much as possible. However, recycling is actually a system of collecting and processing used materials that still have value. This means not everything is recyclable. There must be someone to buy the used material and transform it into a new product. And just because a product has a recycling symbol on the bottom does not mean it’s recyclable. So, why is it important to debunk the recycling myth? Though most of us are well-intentioned, when we put materials in the bin that don’t belong, we’re actually contaminating the recycling stream and harming the recycling process. When you don’t recycle right, this negatively impacts our environment and economy. So, we need your help to recycle right! Only the Big 4 should be placed in your recycling bin: 1) corrugated cardboard, 2) plastic bottles and jugs with a neck, 3) metal food and beverage cans and 4) glass bottles and jars. Everything else does not belong in your recycling bin. If you think something may be recyclable (like newspaper or plastic bags), visit earth911.com for a list of potential drop-off locations. Otherwise, place the material in your trash. Do not put anything other than the Big 4 in your recycling bin. Remember the phrase: “When in doubt, throw it out!”. LCSWMA will transform discarded waste into renewable energy. LCSWMA offers 24-hour recycling drop-off centers at each of our three Lancaster facilities: Transfer Station Complex, Lancaster Waste-to-Energy Facility or Frey Farm Landfill. Residents can bring any of the Big 4 (see above). LCSWMA DOES NOT PROVIDE YOUR CURBSIDE RECYCLING PICK-UP. Each municipality (city, township or borough) within Lancaster County is responsible for your curbside recycling. If you live in Dauphin County, please contact the Dauphin County Recycling Center for more information about your local recycling program. Have questions about recycling at your organization or business? Contact LCSWMA at (717) 397-9968 or info@lcswma.org. 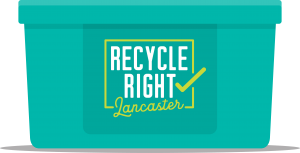 For more information about Lancaster County’s recycling guidelines, visit recyclerightlancaster.org.